ChartMogul is a leading analytics platform that integrates with various payment providers and offers detailed analysis and reports on customer subscription trends, recurring revenue from customers and more. 1. Login to ChartMogul and navigate to “Admin” tab. 2. Go to “API” sub-tab and copy the values of “Account Token” and “Secret Key”. 1. Login to HappyFox and navigate to “Apps” module. 2. You can either search for “ChartMogul” app or find it listed under “Analytics and Reporting” category. 3. Install the ChartMogul app. Once installed, you will be prompted to enter the “Secret Key” and “API Key” from ChartMogul. 4. Click on “Save”. This also enables the integration. 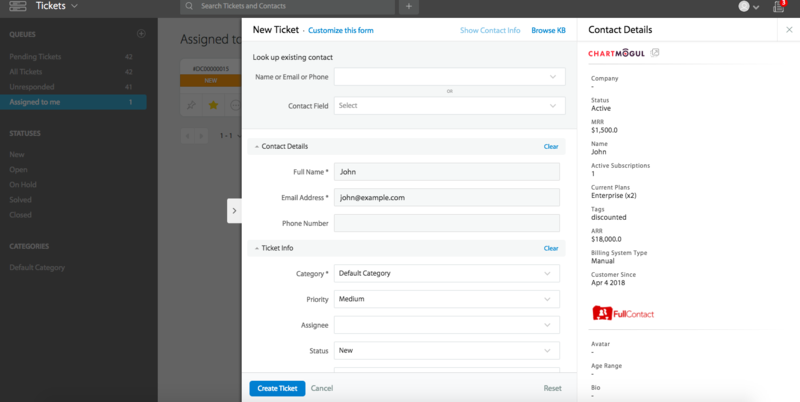 Subscription information about your customers will now be visible on any tickets that they have raised. This information will also be available when your agents create new tickets on behalf of your customers.